And so the deluge begins. 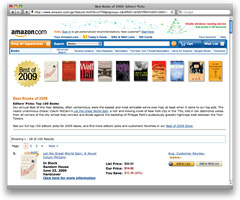 Hot on the heels of Publishers Weekly's list of the best book of 2009 comes Amazon's editors' take on the year in print . Frank Bruni's Born Round — which topped PW's nonfiction best-of — takes Amazon's 28 spot overall, with Momofuku hot on its heels at number 31. Michael Ruhlman's on there twice: his Ratio is 61, and at 80 there's Ad Hoc at Home (which he co-wrote with Thomas Keller). The "Reader's Picks" section is a list of the year's hundred best-selling titles, which unsurprisingly have a high proportion of health and diet books. In terms of true cookbooks, though, the pickings are slim: the only one to crack the hundred is Lisa Lillien's food-hating Hungry Girl: 200 under 200 coming in 14th overall — and we're not sure whether the fact that it sold more than Sarah Palin's Going Rogue is a good thing or very, very bad.